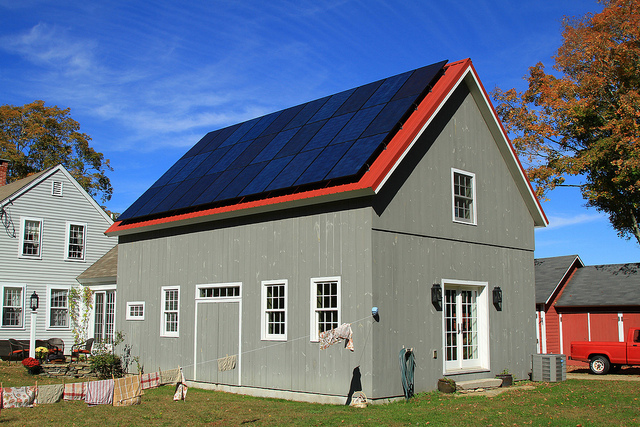 Planning on putting solar panels on your house? If so, don’t get sucked into making it “grid-tied” like the vast majority of Americans. When the power goes out, they will not be able to use the power being produced on their roof. The key is to have a battery bank. Before we dig into this topic, remember that your first focus in preparedness should be on food, water, shelter, and self-defense. After that you can expand to advanced topics like generating power. Don’t waste your time with hydro or wind power, they are rarely cost-effective compared to solar. Solar has become easier now that the prices for panels and equipment have dropped. If you have a properly sized solar system it will generate power in a slow, steady stream all day but you still have to capture and store that power. Use a battery bank to store up daytime power for use at night and during cloudy days, instead of relying on the grid. There are also times when you need a big boost of power, like when the well pump first comes on. Battery banks are expensive and, depending on the type of battery you choose, can be a very frustrating part of the system. Solar panels easily last decades with hardly any maintenance, but the typical lead acid battery banks require frequent water level maintenance. Another frustration comes every 5 to 10 years when you have to replace and dispose of the extremely heavy lead acid batteries. Fortunately, there are better, lighter battery options out there. At the time of this writing, the best off-grid battery option is the Lithium Iron Phosphate or Lithium Ferrous Phosphate (LFP) batteries from SimpliPhi Power. At first glance these batteries look incredibly expensive at $1,000 to $3,000 apiece which seems like 10 times the cost of an equivalent voltage and amp-hour rated lead acid battery (such as the Trojan T-105, a popular deep cycle golf cart battery)—until you compare them to their lifecycle cost. As I wrote last week, lead acid batteries lose life cycle capacity faster if you discharge them deeply. Even so-called “deep discharge” batteries are most efficient when you only discharge them by 20%. The T-105 golf cart batteries get about 3,000 cycles at this depth of discharge and then you need to haul them out and find some way to dispose of them. Compare this to the LFP batteries from SimpliPhi which are rated for 10,000 cycles all the way down to 80% discharge. AltEStore.com (which sells both batteries) did the math and found the LFP batteries were almost 10% cheaper over their life span. Not only are LFP batteries cheaper in the long run but they are lighter, smaller, recharge faster, release power faster and you don’t need to ventilate them. That means you can store them anywhere, including a crawlspace. They won’t overheat, unlike other lithium-based battery technologies. SimpliPhi’s batteries come with embedded circuitry to avoid over-charge, over-discharge, shorts, or unbalanced cells. Also, a built-in 80 amp breaker eliminates any risk of over-current and provides a convenient on-off switch to that battery. But the biggest advantage is that they require no maintenance. You will never have to check the water level and rarely, if ever, replace the batteries. The only drawback is they can’t be linked in series for higher voltage systems—48V is the highest unit right now. The cheapest prices I have found are at the Alt-E Store and at Northern Arizona Wind and Sun. Why Not Tesla Powerwall 2? Other manufacturers of Lithium Ferrous Phosphate batteries so far have failed to provide the same number of cycles and depth of discharge as SimpliPhi. ReLion, for instance, shows their slightly cheaper batteries losing up to 40% capacity after 10,000 cycles at 80% depth of discharge. 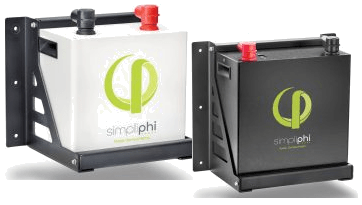 SimpliPhi warranties their batteries for at least 80% remaining capacity after 10 years or 10,000 cycles.